Almost every film I see these days seems to demand fact checking. Sometimes I think this must be the real meaning of that buzz phrase “transmedia storytelling.” The marketing blitz draws you in and then you watch a narrative unfold that seems so overblown you can’t help going on line to sort out the real from the fanciful. You read articles, which lead to news videos, or maybe even a pre-existing documentary. By the time you’re done, you’ve engaged in a multitude of storytelling platforms just to get to the truth. All that’s missing is the video game. In American Hustle, as soon as I heard one of the characters utter the name Abscam, my urge to look it up almost overrode my desire to keep watching the film. Reading about Dallas Buyer’s Club, I found out that all that being-chased-down-by-the-FDA never happened. Whereas with Wolf of Wall Street, the shock was in learning that all that dancing-on-desktops really did happen. After Captain Phillips, I learned that the crew actually sued the captain and the shipping company for charting a direct route well known to be at high risk for pirates. 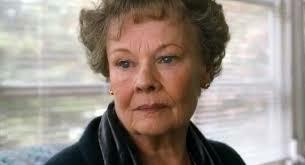 As for Saving Mr. Banks, it was not difficult to uncover that P.L. Travers never did warm up to Walt Disney and, rather, hated his rendition of her beloved Mary Poppins to her dying day. Accompanying last year’s Argo, there was all that business about Canada’s critical role in the rescue being ungratefully diminished. And, of course, who knows what the hell happened in the real story of Zero Dark Thirty. The trend has become so pervasive that, halfway through Philomena, another film “inspired by true events,” when I realized I was not gripped by a burning need to look it up, I was genuinely surprised. That meant this based-on-a-true-story was somehow managing to be highly satisfying all by itself. So then I became curious as to what it is about the film that enables it to stand on its own. My immediate suspicion was that the answer lies in the film’s character portrayals rather than the plot. Let’s look at the plot: Philomena tells her daughter, Jane, about the son she was forced to give up for adoption almost 50 years earlier. Jane finds a journalist, Martin, to help them find the long lost son. 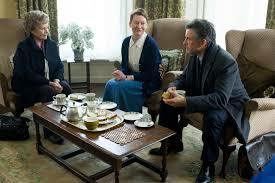 Martin and Philomena go to the convent that arranged the adoption and are stonewalled. But they learn from a local barkeep that most children taken by the nuns were sold to Americans. So they go to the U.S. and soon learn, first, that Anthony was an attorney in the Reagan Administration and, then, that he has died. They meet a professional colleague who tells them he was gay and died of AIDS and they meet his adopted sister who tells them his lover Pete fought the adoptive family to not bury him in St. Louis. Finally, after some persistence, they make contact with Pete, who tells them Anthony went looking for his mother in Ireland and is buried at the convent where he was born. They return to the convent and visit his grave. We don’t see here the same level of complications, obstacles, reversals and conflict-driven action that we see in all those other true-to-life stories. True, Martin and Philomena hit a couple of dead ends, but they fairly easily find their way around them. So not a lotta plot, which I find impressive. It takes confidence to write a screenplay without much action because that means you have to rely on character development to keep the audience engaged. And, as we all know, there’s a high risk of failure. Of course, Philomena’s story, stemming as it does not from any concrete life-or-death struggle but rather from an internally generated urge to know the truth, is an apt canvas for explorations of character. Let’s look at the characters. First, we have a very personal, emotional story in Philomena’s quest to learn what happened to her son. We sympathize with her as a mother who lost her child and was vilified for having normal human impulses. She is the wronged party. The internal journey we witness in her is the struggle of whether or not to make her story public. She wants to know the truth about her son for herself, to get closure and a degree of healing if possible. But she is still burdened by shame and guilt and, thus, vacillates about going through with the magazine piece. In the course of the story, she progresses from keeping a secret to, not only telling her family, but telling the whole world. Then there’s the journalist Martin, whose goal is to expose the terrible injustices that were committed and the human damage that was done in the name of the church. Martin embodies our collective outrage that this could have been allowed to take place, thus, adding a thematic layer on top of Philomena’s internal character story. We identify with Martin’s outrage and desire to correct an injustice. But he didn’t start out that way. Initially, he just wants to get back to work and this seems like a way to do that. He progresses in the course of the story from having disdain for human-interest stories (“stories about weak-minded, vulnerable, ignorant people to be read by weak-minded, vulnerable, ignorant people”) to becoming so invested in her story that, in the end, he crosses journalistic boundaries by disruptively expressing his anger on her behalf. Another layer is brought in with the peripheral involvement of the magazine editor, representing the commercial interests. Her goal is to get a “good story” that will attract readers by appealing to their more prurient instincts. While there is no immediate life-and-death struggle in Philomena’s story, there is plenty of human drama and controversy. Of course, it is these very same tragic elements the editor is wanting to exploit that also give the character story its depth and meaning. Then, in the course of the story, one more character emerges, Philomena’s son Anthony, a.k.a. Michael, who not only is the other wronged party in the Catholic adoption story, but has his own tragic elements in contracting AIDS while working in the Reagan administration, which famously abandoned the gay community in its refusal to fund AIDS research. Through home movies, internet research and the testimony of friends, Anthony/Michael goes from being a complete unknown to becoming a fully embodied person by the end of the story. Also unlike a plot-based story, there is no external gain at the end. No reunion with her son, no triumph over the evil nuns, no living happily ever after. All the gains are internal: information, truth, closure, resolution. 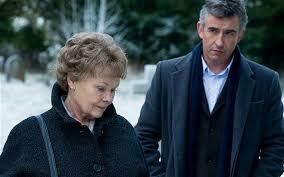 Philomena’s understanding of her life is now fundamentally different. Where there had been only darkness and void, now there is clear picture and a rich story. Where there was hiding in shame, now there is vindication and the support of community. Although there was a cost in having to confront the fact that her son is no longer living, she now has a relationship with him just from knowing that he remembered her, thought of her and tried to find her again. No matter how bad the outcome, it’s better to know the truth. Not that the writers of this film did not play around with facts to serve their narrative flow. They did (eventually I googled it when preparing to write this piece). The difference is in the purpose they are trying to serve by doing so. Are they manufacturing exciting action sequences to guarantee audience engagement in case all other elements fail? Or are they simply clearing away extraneous events and smoothing awkward chronologies to bring more focus to the characters’ internal lives? The story of Philomena is as much about the relationship between a power elite political journalist and a common Catholic retired nurse as it is about solving a mystery and exposing a crime. Perhaps more so since each characters role in the story is dependent on the other. Martin’s investigation into the abuses of the nuns without Philomena’s gut wrenching human reality would lack the element of heart needed to help the viewer connect with it. 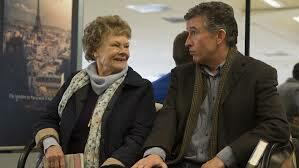 On the other hand, Philomena’s personal story without Martin’s wider perspective would have less collective meaning. There is an irony in the fact that, despite Martin’s denigrating of “human interest” stories, it is precisely because this story is putting human interests first that it rises above the other true to life stories that focus on plot alone. Makes me wonder if, in all those other films, my urge to go home and google it is actually an urge to go in search of a greater human Truth. There was one item I looked up on Google soon after seeing the film. I was curious to see how Jane Russell’s adoption of an Irish child was characterized on Wikipedia and such. I learned that Russell did indeed adopt three children, but only one is supposed to have come from Ireland and not from the Roscrea Abbey, where in the film Martin sees Russell’s picture on the wall. Interestingly, though, this mini-investigation lead me to a Youtube video of Russell doing a song and dance number called “Looking for Trouble,” which, if it were true that Russell adopted from this convent, would provide veritable proof of commercial motives on the part of the nuns. If the nuns truly felt the young women in their charge were unfit for motherhood because of their sexually profligate ways, there’s no way they would entrust a child to the likes of Jane Russell. So neither are the makers of this film above including a fanciful bit of dramatic license to help their story along and drive home a point about inherent contradiction.